Description: How to Believe God for Your Healing. 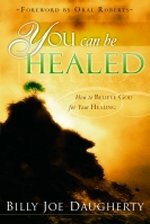 You Can Be Healed is a powerful book that defies conventional, worldly thought and confirms spiritual, heavenly wisdom. Billy Joe Daugherty, pastor, author, and broadcast minister, shares healing words that drive out oppression and welcome in health and wellness. Your inheritance of a healthy, joyful life is available here and now—expect to be healed. Known for his clear and compassionate style, Daugherty provides hope through the Scriptures about God's desire for His children to be whole. Through your heavenly Father's mercy and loving kindness, your faith plays an important role in the healthiness of your body, mind, and soul. "Sickness is an invasion of an outlaw force seeking to rob you of your health," and through the realization of God's promises and the steps provided in this book, you will enjoy the abundant life that the Great Physician promised—You Can Be Healed!